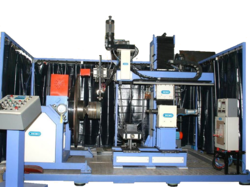 Pioneers in the industry, we offer pta hard facing machine from India. PRIMO is the Pioneer in India when it comes to PTA Hard Facing Machine. PRIMO has successfully satisfied more than 75 Customers in India and across the globe in the last 20 Years for various PTA requirements. We would very happy to hear from you the exact requirement. Looking for PTA Automatic Machines ?